Terry joined the Lightfoot band in 1970; his first record with Lightfoot was Don Quixote in 1972. His lead solos have been a feature of Lightfoot's recordings and live shows for four decades. (In a recent cover of Sundown, Toby Keith's lead player does an admirable tribute to Terry). His skill with the flatpick placed him on the top rung of lead players; the next time you sit back to enjoy a Lightfoot tune, pay careful attention to the lead, and remember a great player. 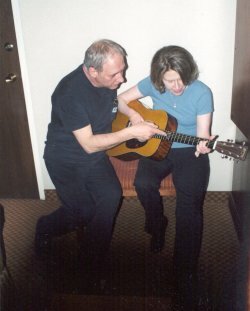 Not only was Terry an extraordinary guitar player, but he was a lovely man as well. I will miss him. The personal photo here, taken after a show in 2002, is one which I will always treasure. 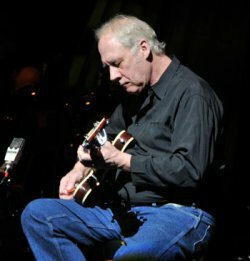 Hamilton guitar player Carter Lancaster replaced Terry Clements in the band. Read interview: Guitarist Carter Lancaster set to debut as lead Lightfoot guitarist in Greensboro.